Samsung debuted its Z series with the launch of the Z1 back in January last year. This was followed by the release of the Z3 in October. And now, it looks like the South Korean company will soon fill the gap by launching the Z2. 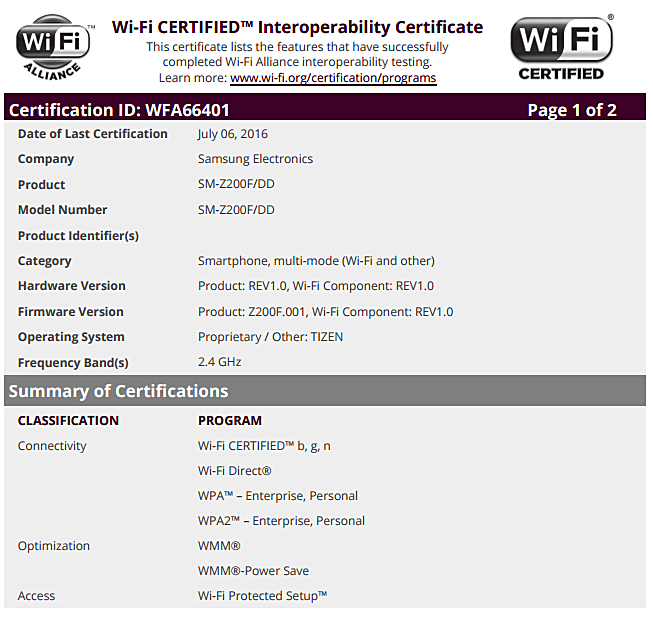 A new Z series device with model number SM-Z200F - which in all likelihood is the Z2 - has received Wi-Fi certification from the WiFi Alliance (WFA). The model has already received certification from the Bluetooth Special Interest Group (SIG), so it won't be a stretch to expect the device getting official sooner than later. Its rumored specs include quad-core CPU, 4.5-inch display, 1GB RAM, Tizen 3.0 OS, and 2,000mAh battery. I swear none of GSMArena's commentators finished primary school before being given internet privileges. Who is this stupidhead? What do you know about Linux? A lot of OS based on Linux. You call that android too? It just like saying we all are apes. So you are a gorilla too.